Annual Reviews of Analytical Chemistry helps researchers keep up with leading developments. For example, recent articles have explained advances in proteomics, the protein-based counterpart to genomics that calls for measurements of protein inventory and activity at different stages in the cell’s cycle and in healthy as well as diseased individuals. 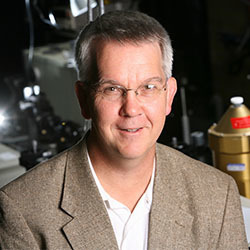 Bohn, who came to Notre Dame nine years ago after 23 years at the University of Illinois at Urbana-Champaign, conducts research in the areas of chemical analysis, materials chemistry, and molecular technology. He is also director of the Advanced Diagnostics & Therapeutics initiative and the Initiative for Precision Medicine. Originally published by Gene Stowe at science.nd.edu on February 25, 2016.